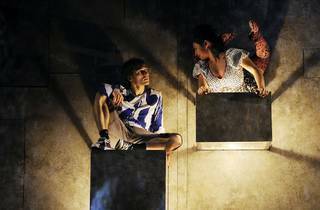 Canada is hitting it out of the ballpark in circus, what with Cirque du Soleil, Les 7 Doigts de la Main and now Eloize making waves in the French capital. This new show, ‘iD’, explores how the individual can express himself in public space, meeting people and even punishing himself. Directed by Jeannot Painchaud, ‘iD’ is a mixture of western circus and hip-hop culture; juggling becomes breakdance, tightrope walking takes place amid blares of horns and police sirens, cycling defies the laws of gravity. An hour and a half of leaps, stretches and dance steps in front of a hypnotised audience, who almost forget to breathe in excitement. The acrobats’ talents are amazing, but the real draw of Eloize lies in its ability to create a universe influenced by cartoons, videogames and graffiti. A city silhouette, a few light effects, some electro-rock music and suddenly you’re in a playground of infinite possibilities. Far from simpe athletes, the artists of Eloize are true storytellers.